JACKSONVILLE, Fla. (AP) — The Jacksonville Jaguars will go down in history as the NFL’s top rushing team in 2017. They haven’t looked like it lately. The Jaguars failed run the ball with much consistency during the second half of the season, including a wild-card victory against Buffalo. Jacksonville found few holes against the Bills until quarterback Blake Bortles started scrambling in the second half. Still, the lack of a reliable ground attack is a major concern for the third-seeded Jaguars (11-6) heading into Sunday’s playoff game at No. 2 seed Pittsburgh (13-3). Little, if anything, changed down the stretch while Jacksonville continued to struggle. The Jaguars averaged 3.58 yards a carry over the final seven weeks of the regular season, ranking 30th in the NFL. They ran for 155 yards in a 10-3 victory against the Bills, but more than half of those came from Bortles. His 88 yards rushing were the most by a Jaguars player in nearly a month. 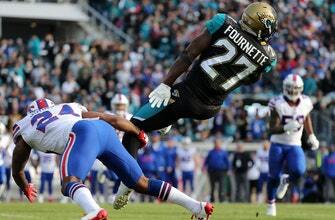 Rookie Leonard Fournette hasn’t looked the same since spraining his right ankle against the Los Angeles Rams in mid-October. He ran for 181 and 130 yards in consecutive weeks against the Steelers and the Rams, respectively, and broke off long touchdown runs in both games. –Fournette is missing holes and assignments. He’s running with authority, but not waiting for holes or looking for cutback lanes. –Opponents are loading up against the run because they have little respect for Bortles and a banged-up receiving corps that features two rookies. Allen Robinson (knee) was lost for the season on Jacksonville’s third offensive play, and Allen Hurns (ankle) and Marqise Lee (ankle) have been slowed lately. Although newcomers Keelan Cole and Dede Westbrook have been better than expected, they looked like rookies in recent weeks. –Jacksonville’s offensive line has been average at best, and every starter has missed games with injuries. Brandon Linder, one of the league’s highest-paid centers, has been solid. But guards A.J. Cann and Patrick Omameh have struggled at times in a rushing attack that averaged 1.9 yards before contract (also 30th in the league) over the final seven weeks of the regular season.